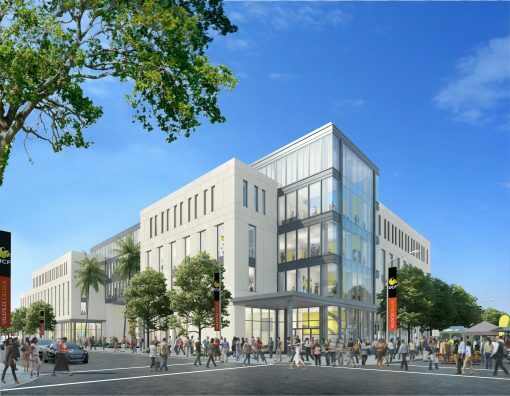 Leaders from across Central Florida are expected at the highly anticipated groundbreaking ceremony for the UCF Downtown campus from 10:30 to 11:45 a.m. Thursday, May 11. The UCF community is invited to attend the festivities at the UCF Center for Emerging Media, 500 W. Livingston St., with partners from Valencia College, the City of Orlando, Dr. Phillips Charities, the Parramore Kidz Zone and many more. Among the scheduled speakers are UCF and Valencia leaders, Orlando Mayor Buddy Dyer, Orange County Mayor Teresa Jacobs, and some students who are expected to attend classes at the downtown campus when it opens in the fall of 2019. Join us after the event to sign our interactive wall and take groundbreaking photos (complete with shovels and hard hats). Local food trucks also will be onsite just in time for lunch. When it opens, the campus is expected to bring 7,700 students from UCF and Valencia College to the new Dr. Phillips Academic Commons building and a renovated Center for Emerging Media. UCF is moving its digital media, communication, health care management and informatics, legal studies and social-work programs downtown. Valencia will offer the first two years of general-studies courses, and programs in digital media and health-information technology. Valencia will also relocate its culinary and hospitality school and provide workforce training and other certificates to increase access to education in the immediate downtown area. For all the latest about the downtown project click here.